British satellite communications firm Inmarsat has recommended shareholders accept a $3.4 billion (£2.6bn) takeover offer from a consortium. 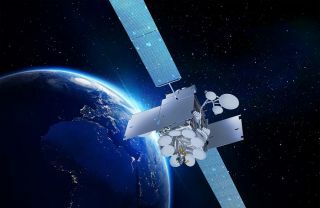 The group, which includes Canadian pension funds and private equity firms Apax and Warburg Pincus, values Inmarsat at $7.21 a share. Inmarsat rejected a takeover from US rival EchoStar last year, claiming the offer undervalued the business. However, it believes the current deal is “fair and reasonable”, leading to the board of director’s recommendation that shareholders accept the offer. What are the limits for satellite connectivity? To sweeten the deal, the group has promised to keep Inmarsat’s headquarters in the UK – it is currently based at London’s Old Street – and to maintain the current level of R&D spending. The company was founded in 1979 as the International Maritime Satellite Organization (INMARSAT) by the UN-affiliated International Maritime Organsiation before it was privatised in 1999. In 2005, Inmarsat floated on the London Stock Exchange. Inmarsat currently operates 13 satellites and provides global connectivity services to the maritime and aviation industries among others. Most recently, its focus has been on global Internet of Things (IoT) and In-Flight Wi-Fi. One of the biggest criticisms of satellite technology is that the latency is too high – something that a new generation of satellites hopes to solve. A number of other firms have also entered the space, including British rival OneWeb which has just raised $1.25 billion in additional funding to launch a commercial service in 2021. The latest round of funding included Japanese giant Softbank, Qualcomm and the Government of Rwanda and brings the total amount raised by OneWeb to £3.4bn.